ISE 2019 highlights: Sonos speakers, 8K projector, McIntosh return | What Hi-Fi? ISE (Integrated Systems Europe), the world’s largest AV and systems custom install show, doesn’t host the wealth of consumer AV product launches that the likes of CES, IFA, Munich High End and The Bristol Hi-Fi Show do. But in amongst groundbreaking digital signage, smart building and home automation innovations are handfuls of cutting-edge AV demonstrations and home entertainment product debuts. At CES 2018, Samsung introduced The Wall, a 146-inch display that can transform to any size thanks to its modular architecture, and features a self-emissive pixel technology the company is calling MicroLED. This year, The Wall concept – designed primarily for luxury residences and business purposes (although there is a consumer-friendly version) – expanded further with a 219in version. And at ISE, the Korean company said it will globally launch a 292in version of the customisable, bezel-free screen in 8K in the first half of this year. We'll take two. TVs aren't the only ones boasting 8K resolutions in 2019. Wolf Cinema’s first 8K projector, which was initially announced at CES last month, was demoed at ISE in an all-guns-blazing home cinema installation in partnership with Tau Audio Solutions. The TXF-3500 beams a 8192 x 4320 pixel on-screen image from SD, HD and 4K sources. What better time to announce a return to custom install than at Europe's largest annual custom install show? US manufacturer McIntosh has announced a five-strong range of power amplifiers and in-wall and in-ceiling speakers, which all made their European debut at ISE this week. The four-channel MI254 (£5995, 250 watts per channel) and eight-channel MI128 (£4995, 120 watts per channel) power amps use power-efficient Class D amplification so don't require noisy cooling fans. 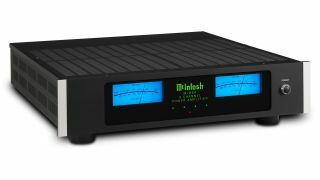 Both feature signal overload technology and BUS input and outputs, with the MI254 offering McIntosh’s five-way speaker binding posts, as the MI128 uses 2-pole push-in terminals. They are joined by the WS500 (£2995) and WS300 (£2495) in-wall speakers, plus the CS200 in-ceiling speaker (£1495) - all three of which are voice-matched to each other for optimal integration. Optoma used the show to introduce an ultra short throw version of its impressive UHZ65 4K projector (pictured), the UHZ65UST, for those whose inflexible environments only allow for a short distance between a screen and a projector. The 4K/HDR-supporting UHZ65UST achieves a 4K resolution through XPR (eXpanded Pixel Resolution) pixel shifting technology, and features Alexa voice control (in US, UK, and Germany models) and built-in Optoma NuForce audio. Pricing is tbc. The multi-room music maestro and architectural speaker specialist Sonance have announced a new range of in-wall, in-ceiling and waterproof outdoor speakers. As we saw coming, the latter marks the first time Sonos hardware has been designed to leave the home. The ‘Sonos Architectural by Sonance’ range is designed and ‘optimized’ for the Sonos Amp ($599/£599), which launched in the US in August and during ISE become available to pre-order in the UK. The Sonos In-Wall and Sonos In-Ceiling speakers are $599/pair, while the Sonos Outdoor by Sonance is $799/pair. Rotel humbly debuted its A11 integrated amplifier and CD11 CD Player, the latest expansion of its established 14 Series (which already includes the A14 and A12 amplifiers and CD14 CD spinner). The CD11 is as versatile as you’d expect from a CD player of today, with both RCA and coaxial connections, while the A11 offers four RCA inputs, a moving-magnet phono stage, and an aptX/AAC Bluetooth receiver. Visitors to Epson’s stand would’ve encountered an AV assault, with the #EpsonVortex experience showcasing 16 double-stacked laser projectors and a custom 4D multi-channel audio soundtrack. As for product announcements, Epson wasn’t short of them, the most headline-grabbing of which was a pro projector capable of 30,000-lumens (That. Is. Bright). It also revealed that a new range of 4K 3LCD laser installation projectors, the EB-L1075U, EB-L1070U and EB-L1050U, which support interchangeable lenses, would be available in September. Each projector is available as ‘body only, giving the user an option of 12 interchangeable Epson lenses, covering short to long throw projection. Continuing the dominating projector trend at ISE 2018, InFocus is another brand with new home cinema models. The company has reintroduced its ScreenPlay home entertainment projector line with the new ScreenPlay SP1081HD and SP2080HD 1080p beamers. The former offers impressive brightness (4000 lumens) and contrast (32,000:1 ratio), while the latter has slightly lower specs with 3800 lumens and 28,500:1 contrast. The projectors are spec’d more or less in line with HD projectors, with HDMI 1.4 and USB inputs and various preset picture modes. They employ low latency technology to make them suitable for gaming, too. They will be available worldwide in March, prices tbc.